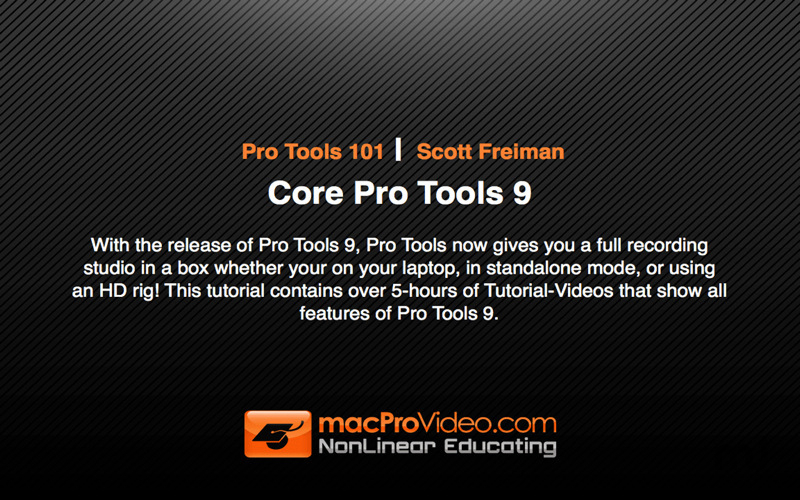 Tutorial for Pro Tools 9. Is there a better alternative to Pro Tools 101? Is Pro Tools 101 really the best app in Music category? Will Pro Tools 101 work good on macOS 10.13.4? Pro Tools 101 is an in-depth tutorial for Pro Tools 9. Pro Tools 101 needs a review. Be the first to review this app and get the discussion started! Pro Tools 101 needs a rating. Be the first to rate this app and get the discussion started! Pro Tools is the platinum standard for working with digital audio. Now its amazing "tools" are available to everyone because Pro Tools "9" is all about flexibility and portability. You can start a session on your laptop in standalone mode. You can move the same session to an HD studio for overdubs. Then bring that same session to your home studio and hook up your Apogee interface or any other Core Audio or ASIO interface for more production and mixing!